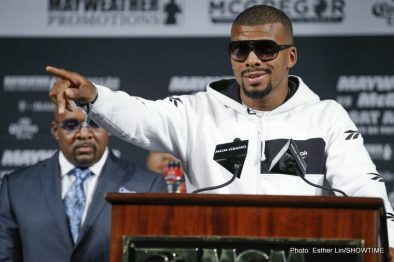 Fighters competing on the Mayweather vs. McGregor undercard spoke to media and went face-to-face Thursday, one day before they weigh-in ahead of their Saturday, Aug. 26 showdowns at T-Mobile Arena in Las Vegas. 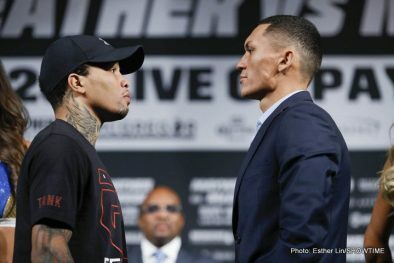 The four-fight SHOWTIME PPV event, beginning live at 9 p.m. ET/6 p.m. PT, will feature undefeated rising star Gervonta “Tank” Davis making the second defense of his 130-pound title against undefeated challenger Francisco Fonseca plus light heavyweight champion Nathan Cleverly defending his belt against former super middleweight champion Badou Jack. 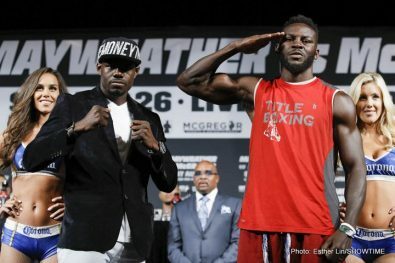 The telecast begins with unbeaten Andrew Tabiti and former world champion Steve Cunningham meeting in a 10-round battle. Additional action inside the arena will see unbeaten Kevin Newman (7-0-1, 3 KOs) in super middleweight action and the pro debut of 2016 Savannah Marshall from London. 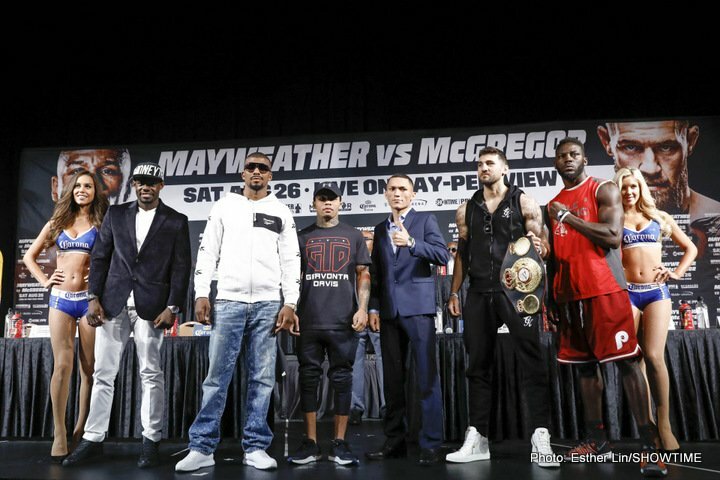 “Saturday night is going to be a great performance from me. I’m ready to take over this sport after Floyd passes me the torch. “I had a great camp. I hope Fonseca’s camp was great because we have to put on a great performance for the fans. I want the fans to say that there is a new star in this sport. “I feel like my career is very similar to Floyd’s so far. We started out at the same weight and we each got our first belt at 130-pounds. I just want to live up to what he’s accomplished and accomplish even more. I believe that I have the skills and the ability to be the big star in this sport. “I just try to stay grounded because I know what I want to do in this sport. Because I have the belief in myself it’s easy for me to stay focused. I also think I have the best team in this sport and they help me every step of the way. “Fonseca is a very good fighter. He’s very fast and sharp. He’s got a long reach but I know that he hasn’t fought anyone that has the skills that I have. I’m not overlooking him. I’m training really hard for this. “I was in the position he’s in now. I know how him and his team are feeling. I know what I have to do to be victorious. I’m going to come out sharp and hopefully pick up even more fans than I have now. 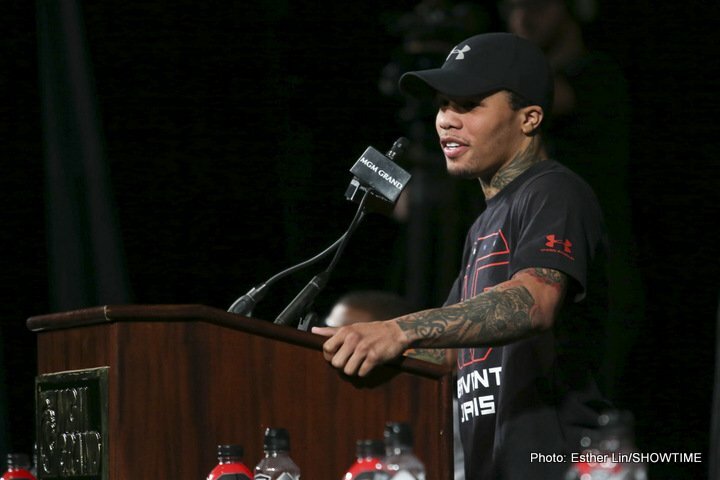 “I want to unify this division and then move up in weight and keep adding titles. If I can’t get a unification bout next, then I’m going to move up for new challenges. “The huge audience won’t intimidate me. I’ve dreamt my whole life to be in an event of this magnitude. “I take this fight as a big responsibility. My dream has always been to fight in an event of this magnitude. My goal is to be a champion and come out of this with a belt on my waist. “The preparation has been long. I’ve had five months of training in intense conditions. I feel strong mentally. On August 26, I aim to reach my goal as a champion for Costa Rica. “This is an opportunity to start writing my legacy. 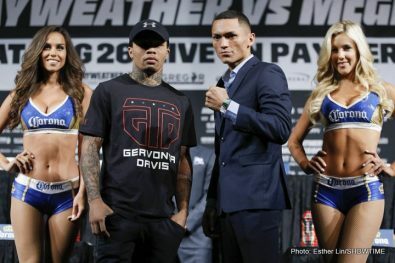 Gervonta is tough because he is a champion, but I have the hunger and motivation to win and be a champion. “All camps are different but in this one I had fivemonths to prepare. We were in Puerto Rico for the training and everything was smooth. I feel strong heading into this fight. “I’m enjoying the experience of being in Las Vegas. I love fighting in this city. I’m looking forward to the fight and I’m going to embrace this moment. “Ultimately, all that matters is the fight. I’m coming to win and that’s my sole focus. The fight is the pinnacle moment and I’m saving all my energy for that. “I’ve persisted throughout my career. Any setbacks I just got right back to training and stayed consistent. If you keep working hard then the opportunities will arrive. I stayed patient and allowed the opportunities to come. “I have no regrets in my career. I like taking risks in this sport. 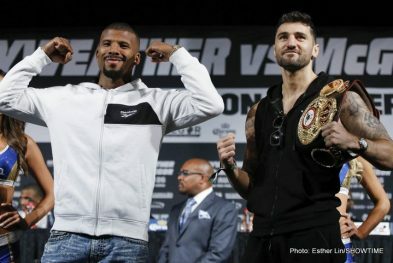 I fought Kovalev when I was 26, I fought Bellew at cruiserweight, I fought Fonfara in Chicago, Braehmer in Germany and now I’m fighting Badou Jack, who’s on the rise. I love the big fights. “I’ve got great stamina in there. I’m never going to get tired. I train hard for this. Every punch in a fight is important. We have a great game plan and we’re going to execute it. “I want to fight the best. I have the skills to beat anyone. If they say I can’t beat someone, that’s the fight I want the most. 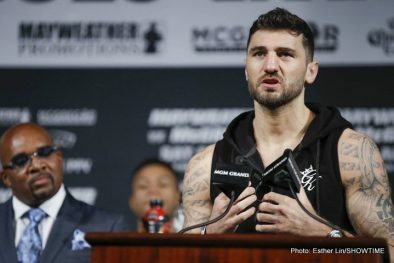 “I’m not overlooking Nathan Cleverly. I’m just getting comfortable at this weight and I’m going to be focused on performing on fight night. If all goes well though, I could see myself finishing my career at cruiserweight someday. “I’ve been fighting big, strong guys since Cleverly was a teenager. Well see who is the stronger man when we’re in the ring on Saturday. “I began boxing because I was being bullied so my stepfather put me in the ring and I would get beat up every day. I learned a lot from those experiences. I just kept coming back every day and I never gave up. Now I’m here. “This sport is about proving people wrong. People said Floyd wouldn’t beat a lot of guys in his career, I’m not saying I’m Floyd, but this is a sport where you have to prove yourself. We’ll see on Saturday. “Being in the gym with Floyd gives me the drive to keep working. Seeing how hard he works, it shows me what I want to be. “I have to use my legs and keep boxing. I need to use my speed in there. It’s different watching me on TV than actually being in there with me. I could see it going the distance but if I catch him, I’m going to finish him. “One of my favorite fighters growing up was James Toney. That’s where I picked up some of my style. He used to hit combos off the shoulder roll and that’s what I like to do. 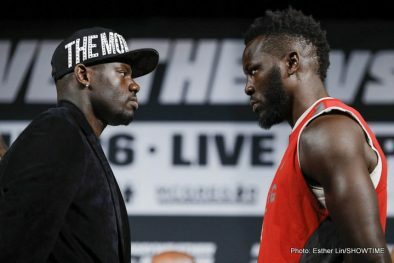 “I actually commentated on one of Tabiti’s fights about a year and a half ago. He’s a good up-and-coming fighter. He emulates Floyd and he’s trained by Floyd’s dad so that’s expected. I think I’m going to overwhelm him mentally and physically. “I don’t think Tabiti is at the top level yet. He has flaws and strengths but at the end of the day, he has a fight Saturday. He’s in there with a two-time world champion so he’s going to have to fight Saturday. “Every fight on this level is a huge fight. I’ve been in the ring with some monsters. Some of the best cruiserweights and heavyweights in the world. I don’t think that I look 41 but you’ll have to let me know on Saturday. “I think this is what Tabiti has been waiting for. I will be nice and calm and be right in his face and right in his chest. “I’m so happy to have this big fight on Saturday night. My team has done a great job to get me to this position. “Having an opponent change is part of boxing. 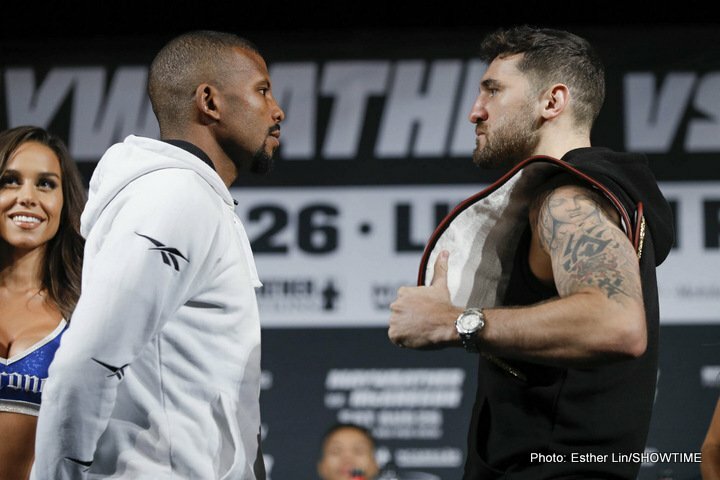 I was already training very hard for Shawn Porter so when the opponent changed, nothing changed in camp. I continued to work hard and on Saturday night I will show why I worked so hard. 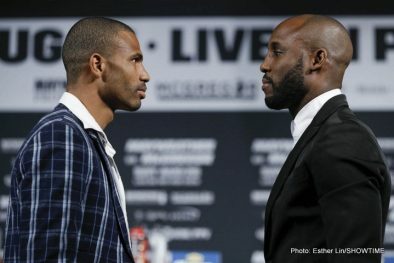 “I want all of my Puerto Ricans to tune-in on Saturday night because I’m going out there to steal the show and put on the fight of the night. “I feel great. I’m ready for Saturday and I’m excited to put on a great fight. I feel very blessed to be here and be a part of such a historic event. “To my Cuban fans, I’m so proud to be representing my country here in Las Vegas and Saturday night it’s going to be a great fight. “My weight is great right now. I feel comfortable and hydrated. Everything has gone perfectly. I’m looking to make a mark in the junior welterweight division. 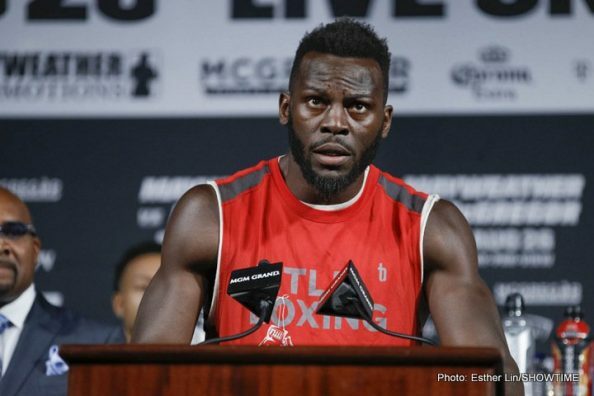 Terrence Crawford is the dream fight and I just want to keep working up to that level. 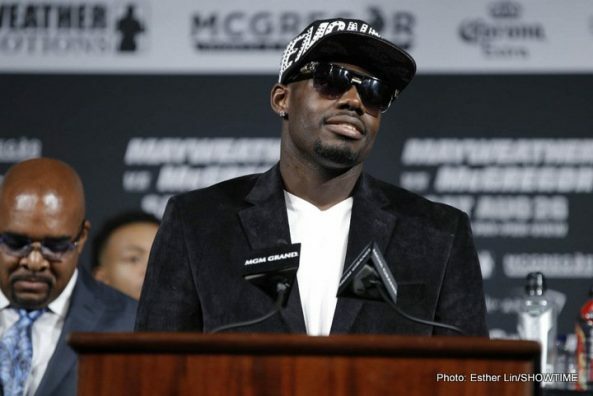 “My career has progressed well and I think this fight is going to make me a contender. From here I just want to keep improving and getting in there with tougher opponents. 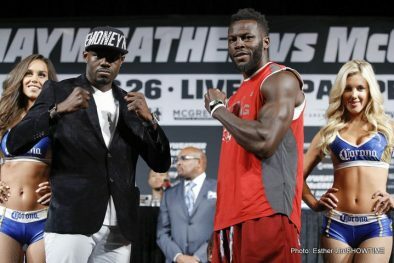 “I’ve been training out in Las Vegas since 1998 but the last two years in the Mayweather Boxing Club has been amazing. Everyone in the gym is so motivated right now. We all push each other by just working harder and trying to match each other. “I feel excited and motivated. Training has been tough but we’re sure we’re ready for Saturday. “The motivation for this kind of card has been tremendous. 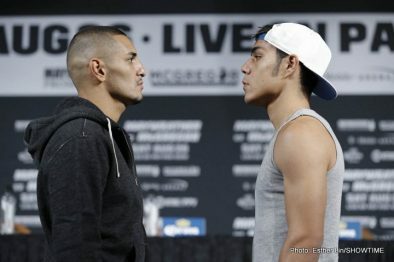 I can’t wait to put on a show for all the Mexican fans who tune-in. “I’ve had a great camp. I’m in top shape. I was really pushed in sparring working with Chris Eubank Jr. and some other guys. I’ve been up running at 5 a.m. four to five miles every day. I’m ready. “I’ve improved a lot mentally. I’ve focused in more. Listening is key for me. I feel like I’m at a stage where I’m listening to my corner and we’re bonding and meshing together great. “I just have to continue to stay focus and work hard. If I’m dedicated and disciplined to my craft, then everything else will fall into place. “I’m happy to be here. I’m in a very blessed position. I can’t wait to go out there and put on a dominant performance. I plan on starting out strong and taking advantage of everything that I can. Previous boxing news: Happy Birthday, James Toney – where does “Lights Out” rank all-time?